That’s a philosophy that I can get behind %100! I know without a doubt that I’m the best wife, teacher, and friend when I’m taking care of myself, getting enough down time and doing things that make me happy. Here I’m wearing Soft Surrounding’s special and artistic Chevalier Shirt. It’s a super soft gauzy gingham material with a gorgeous scarf-like panel in the back. 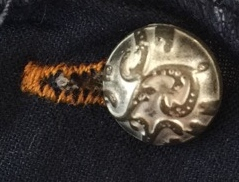 I love all the quality details, like the pretty buttons and the print on the cuffs. Soft Surroundings gave me this shirt to review. All opinions are my own as always. 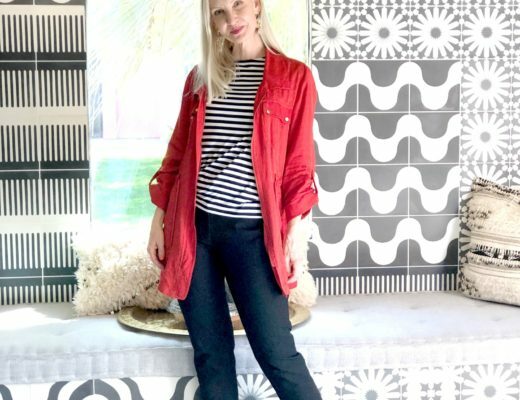 Kacie of Regally Soled does casual right in this simple and modern look. Monika of Style is my Pudding is a creative genius styling a skirt over this dress! 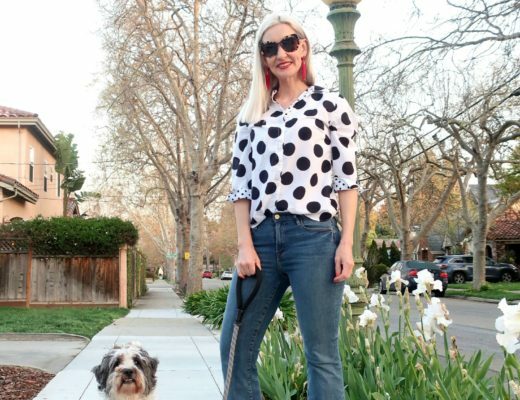 Cathy of Bay Area Fashionista is looking vibrant in this to die for print maxi. And hey, are you on Pinterest? Stop by the new Fun Fashion Friday Pinterest Board! Such a fabulous shirt! And I love the philosophy of the company! Happy (almost) Friday! Have a fabulous weekend! Love the shirt and totally agree with their philosophy. In fact the more I look at that amazingly fun and unique shirt the more I'm wanting to put it right on. Looking wonderful, as always, you cute lady. Wow, that shirt is so pretty! I am a sucker for cute "backs" to shirts and dresses and this one is lovely. And I have those same booties!! Fun stuff lady, I love that you take time to enjoy life and take care of you. It's probably why you glow with beauty inside and out!! What a fun top, love all the great details! That top is beyond FAB – Have a lovely weekend! I have never seen a shirt like this one with that beautiful pattern in the back, but I absolutely love it. I will definitely be checking them out! Thanks for the link up! I like that philosophy as well as the clothing. It all looks so comfortable and modern. The shirt you're wearing is right on trend and, as usual, you look fabulous. That shirt is fabulous! 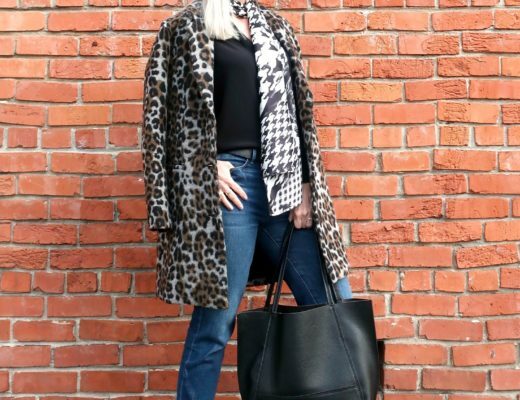 The scarf print detail on the back is a nice surprise! So good to join you. I love that shirt so much!!! What a pretty shirt! Pattern mixing in one piece. Love that shirt and the whole Soft Surroundings catalog. They have so many pretty things. Happy weekend and anniversary Dawn! The embellished print on the back is pretty amazing. Thanks for the linkup. The details on this top are amazing! I love this look so much. What an awesome top!! Such a great look! What's not to love about that blouse? Love it! 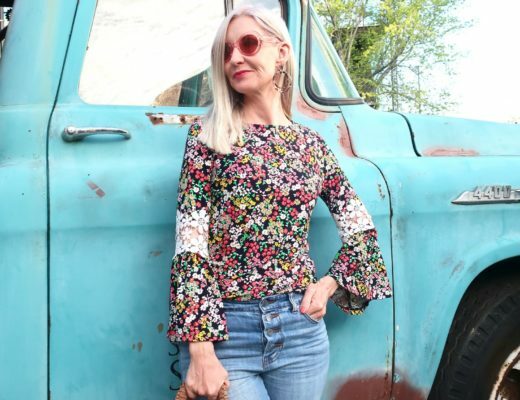 Love this unique top from this brand! Thanks for sharing. 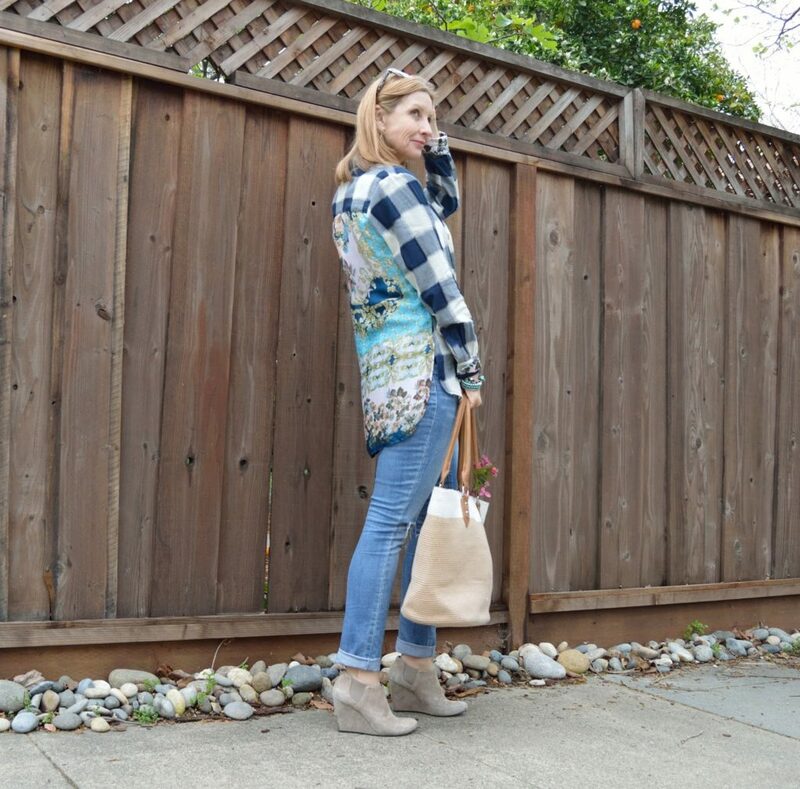 I love the mix of plaid and floral! That shirt is so adorable and so fun!!! Have a super weekend Dawn Lucy! Oh, I love the unexpected surprise in the back of this top! And those wedges are so Fun! Such a cute shirt! I love all the fun details! I could feature you every week, Doll! Muah! Such a great look! And I'm so jealous of your flowering tree and flowers! Everything is still dead and brown where I live. Love the print and you get gingham and a pretty print all in one. The wedge boots are sleek , nice outfit,my friend. I also love the name of the company and what they represent. Everything I wear has to be soft, or comfortable. Dawn Lucy on paper I bet that shirt sounds like it wouldn't work – but it so does IRL!! I love it! Enjoy the spring-like weather this weekend and thanks again! Such a unique shirt Dawn Lucy! You look FAB!! You are rocking that blouse, Dawn…as usual 😉 Thanks for sharing your flair the Thursday Favorite Things Blog Hop! 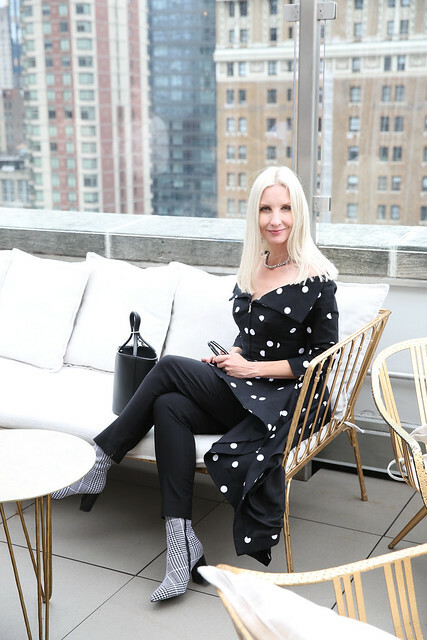 I am loving this blog for fashion over 40. I've been Reading past posts as well as this post and I love your style, the link up is gorgeous too what a great niche. As an over 40 myself this is lovely to see< what fashion is for this age, I often ask myself is this too junior? I'll be referring to your blog now! The detailing in that top is so fun! The back is so unexpected. the details on that shirt are amazing!! 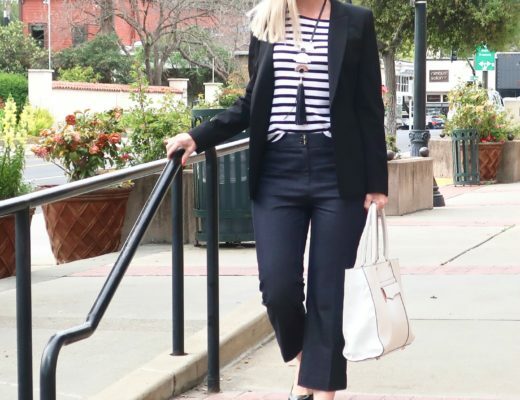 Love how you style too, the outfit is perfect for spring! I LOVE that Soft Surroundings blouse, love the combination of fabrics- very very cool Dawn. May have to hop on over to check it out! 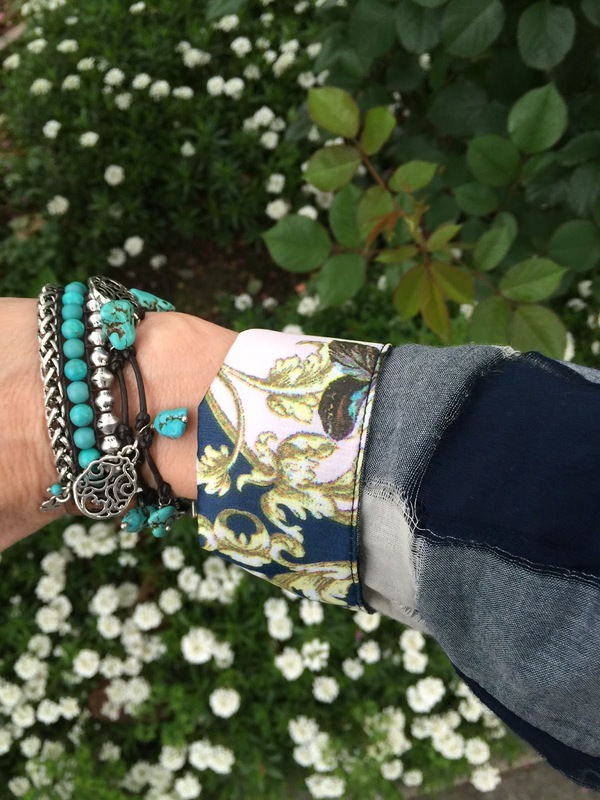 Beautiful shirt….I am loving this blog for fashion over 40.